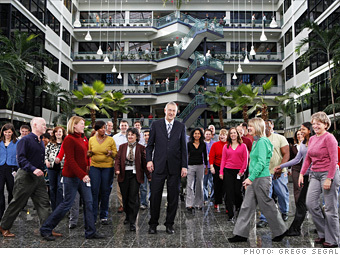 CEO Dr. Goodnight, shown here with employees at SAS�s headquarters. One of the Best Companies for all 13 years, SAS boasts a laundry list of benefits -- high-quality child care at $410 a month, 90% coverage of the health insurance premium, unlimited sick days, a medical center staffed by four physicians and 10 nurse practitioners (at no cost to employees), a free 66,000-square-foot fitness center and natatorium, a lending library, and a summer camp for children. The architect of this culture -- based on "trust between our employees and the company" -- is Jim Goodnight, its co-founder, and the only CEO that SAS has had in its 34-year history. Some might think that with all those perks, Goodnight was giving away the store. Not so. 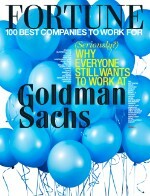 SAS is highly profitable and ranks as the world�s largest privately owned software company. Turnover is the industry�s lowest at 2%. Headquarters: 100 SAS Campus Dr.